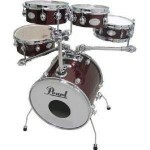 The Pearl Rhythm Traveler POD, or GIG, is now in it’s third generation. Differences between the generations are limited to the lugs, colour of metal parts and hardware as well as the size of the snare. 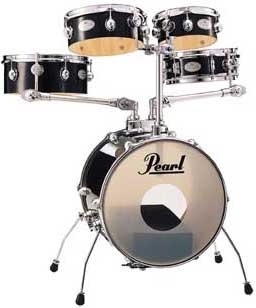 The first generation had semi-spherical lugs shaped like a half “ball” and large-ish looking on the small size drums. 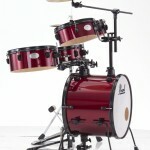 The second generation received updated, smaller lugs, more proportionate to the drum sizes. Both first and second generation kits had all chrome metal parts and hardware as well as a 10″ snare and were both referred to as “GIG. 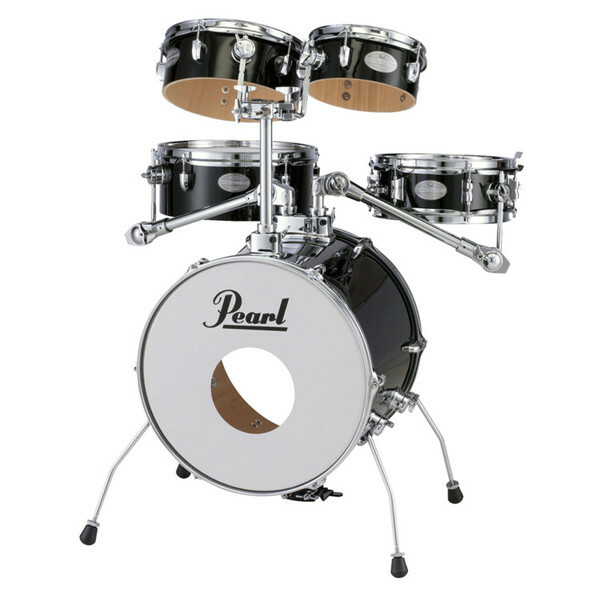 The third and current generation, labelled “POD” has the same smaller lugs as the second, but now has black metal parts and hardware, except for the Hi-Hat stand, which is still chrome and bass drum pedal, which is still aluminum / black. 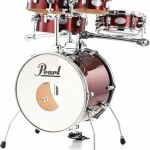 The current POD also comes with a 12″ snare and is offered in three finishes, Jet Black, Pure White and Red Wine. To confuse matters the first generation “GIG” remains the current offering in Europe. For the sake of simplicity we’ll refer to the kit simply as the “POD” hereafter. 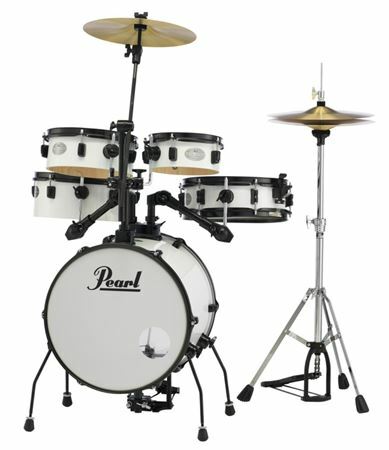 What sets the POD apart from most other compact portable drum kits are the manner in which the toms, snare and included crash are all mounted to the bass drum. 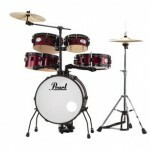 This combined with the smaller sizes of the drums add up to an incredibly small footprint. We have a first generation kit permanently set up here that measures a measly 47 inches, or 120 cm across the width, from the edge of the 13″ hats, to the opposite edge of our added 18″ ride. This kit, however is not the subject of this review, but rather a brand new, current generation kit, generously lent to us by a site visitor, local to us here in Ontario. (Thanks Todd!) 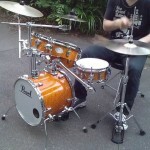 The absence of a snare stand coupled with the small snare drum, allows for placing the Hats significantly closer than would be otherwise possible. Moving the ride a bit or substituting it with a bell, or bottom hat, combined with Mini Hats and a bit of tweaking would make a footprint of under a meter, or 39 inches wide would be obtainable. So what do you get when you fork out US$499 (street price, list price is US$ 832) of your hard earned loot? Quite a bit actually. 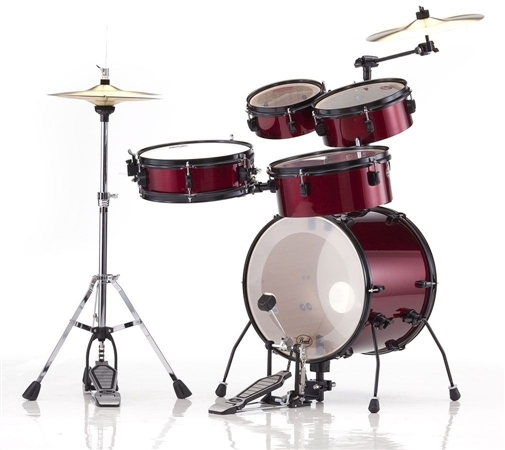 Neatly packaged in two boxes you will find the following drums; 16 X 13 bass, 8 X 3.5 and 10 X 4 toms and a 12 X 5 snare, all made of 100% mahogany shells. 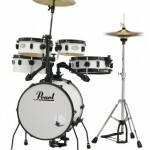 All the drums come with Pearl Pro Tone heads as well as a complete set of mesh heads for silent practice. 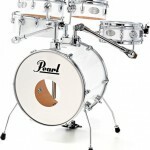 The bass drum resonant head has a pre-cut port close to the edge. 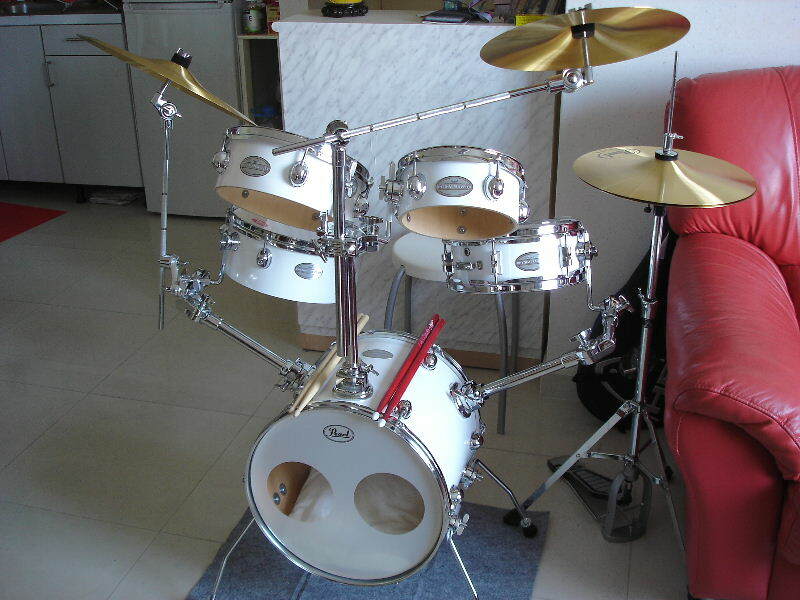 Cymbals included are 13″ Hi Hats and a 13″ Crash. 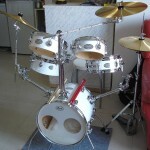 The included hardware comprises of a Hi-Hat stand, Bass drum Pedal, Short boom arm with post, Four bass drum spurs, Bass drum riser/pedal mount, a dual ball joint mount with post for the high toms that also has an additional clamp for the crash and two dual articulated L-arms for the floor tom and snare. 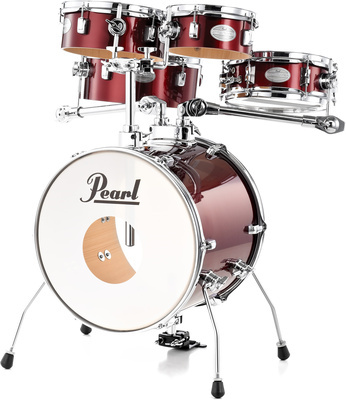 The tentacle-like snare and floor tom arms have regular pearl-style ratchet-joints at the bass drum end, and ball joints on the tom/snare ends. 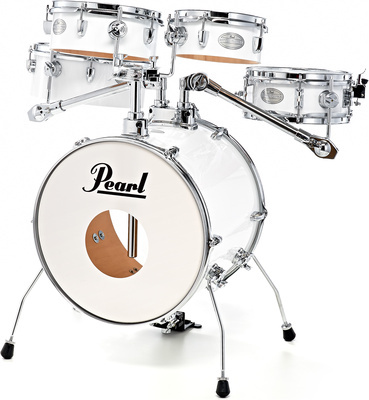 The toms and snare mounting brackets are not of the typical pearl type but rather the slim rods usually seen on Tama and Premier kits. As are the ball joint mounts and attached slim-style L-rods. Hardware: The Hi-Hat stand feels slightly stiff and awkward out of the box but since I’ve had three of these identical stands of my own, I know from experience that they loosen up over time. A bit of lube may accelerate this process. It is of a lighter construction but well made and with excellent chrome finish. Probably not able to handle repeated abuse, but should prove good long-term durability with regular care. 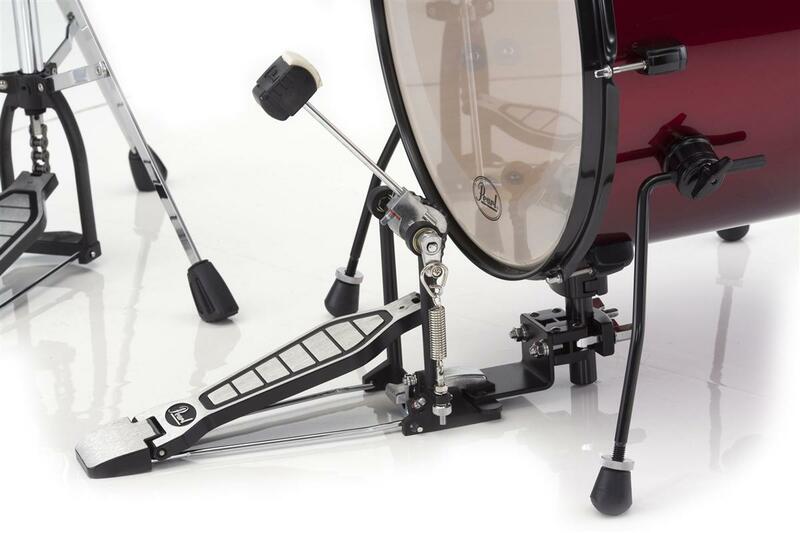 The bass drum pedal is also one I’m familiar with, it’s nimble and light and resembles the P-100 pedal that came with the Exports in the 90’s except just a “tad” smaller and with black posts and base. It’s well made except the chain is very light gage. Personally I could never dial this pedal in to suit me, but I suspect this is a personal preference as I haven’t heard any complaints from anyone else. 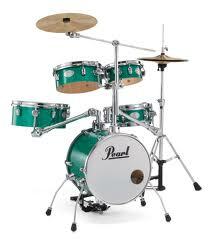 The bass drum riser is the same that comes with Pearl’s “Jungle Jig” (JG-16). The design is simple yet ingenious. Consisting of a base with the protruding “lip” for the pedal to clamp to and an additional clamp on the opposite side of the lip that holds the post. 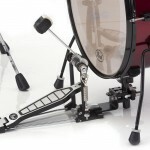 The post itself simply inserts into a tom mounting bracket on the underside of the bass drum. The clamp portion has two different size “halfs” that are reversible to accommodate either a hoop or a rim, and/or varying pedal designs. There isn’t much to say about the boom arm for the crash, except that it’s odd seeing one in black. The double articulated arms for the snare and floor tom appear to be under a fair bit of load. However they hold up well over the long haul. The only issue I’ve ever come across is one of the locking pins slipping out a “smidge” causing the snare-end ball joint to twist. This was quickly rectified with a couple of hammer blows with a counter-sink. I can’t tell if the black is anodized or powder coated, but it holds up well even after repeated set-ups and tear-downs. The spurs don’t look too confidence inspiring, but hold the entire contraption steady and stable. We haven’t seen any hardware issues of any kind on our first generation kit after years of use, except the mentioned incident with the slipped locking pin. 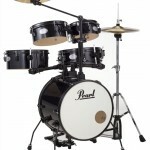 Drums: As mentioned, the black finish on the hardware is of good quality and quite durable. The same goes for the finish on the lugs and rims. The lugs are the same small, low-mass and spring-less design found on the regular RT. The wrap is of average quality and adhered only along the leading and trailing edges. Something that may have some negative effect on the resonance of the snare and bass drum, but likely not on the single headed toms. All the drums have a smooth finish on the interior of the shells. All-in-all the component and build quality is equal to or better than my expectations of a kit in this price range. The tolerances however far exceed my expectations. 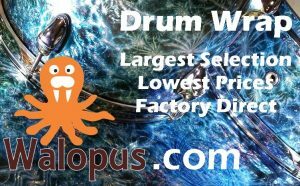 All the drums are within 1 mm of perfect roundness. The bearing edges are all flawless, the “trueness”, or how flat the bearing edge surface is, are all within 0.2 mm. These are the best tolerances I have ever measured on a kit that can be had for under US$ 500! Since there is no way to utilize memory locks for your preferred position of the ball joints, portability and set-up times are on opposing sides of a scale. Maximizing portability means folding all the L-rods parallel to their arms. The positive aspect is that with optimized packing the entire kit including cymbals fits inside my soft-case with wheels. (My case came with a patio awning.) I can, in a single trip, carry the whole kit with said bag in one hand and the Hi-Hat stand in the other. The flip-side being that the set-up time is the same as for the first time. 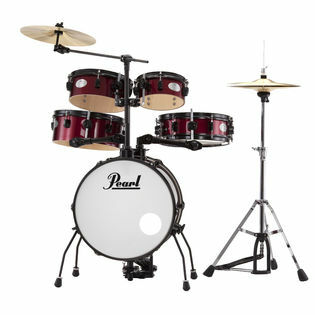 Should I however choose to prioritize set-up time, I simply lift the post with the rack toms and boom arm and place in one half of the back seat of my hatchback, pop out the floor tom and snare and place in the other half of my back seat and drop the bass drum in the front passenger seat without folding the spurs in. In this manner, set-up takes less than five minutes but requires a few trips from the car. The topic of how drums sound is of course subjective. I will share my viewpoint, but I would highly recommend listening to them in person. Also take a look at the Video Sound Samples on this site. 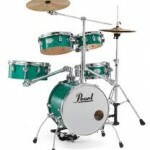 The Pearl Pro-Tone heads supplied with the kit are in my opinion a good match with the drums. Especially the single-headed toms. They do seem to combat the “timbale” effect otherwise common. 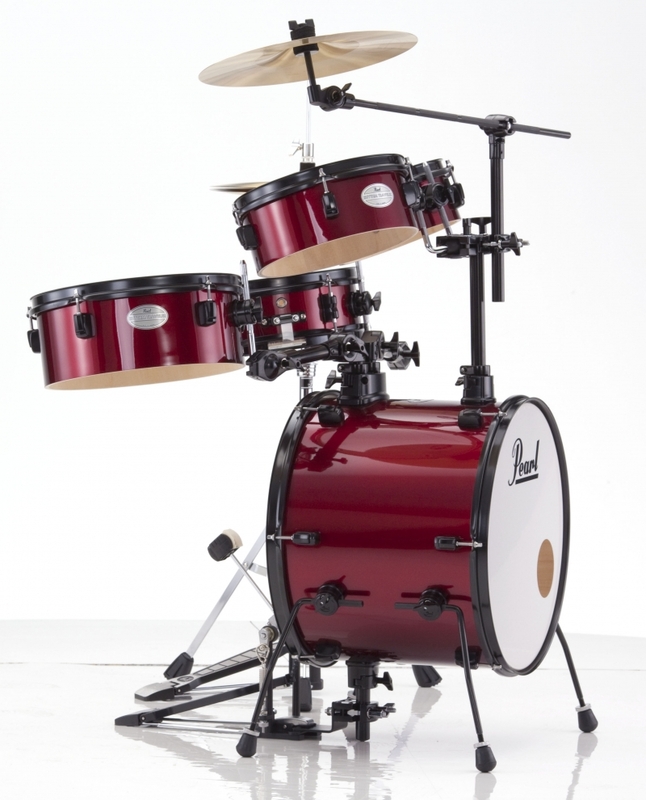 The 10″ and 12″ toms can easily be tuned to almost fool you that they are regular dual sided toms. The 8″, as expected, takes a fair bit of tweaking though. There is a small sweet-spot between a low enough tuning to sound like a tom and not a cardboard box, on the low end, while keeping it low enough not to sound like a timbale. 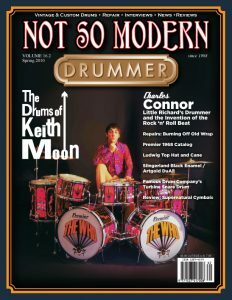 Personally this is a non issue as I usually play four-piece and the 8″ either sits on a shelf, or gets used as a timbale for the odd effect here and there. There is nothing stellar about the snare, but it does the job adequately. With a low tuning and a bit of tweaking it even produces a slight snarl, while with high tuning a distinct crack is easily obtainable. 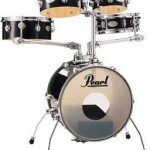 The bass drum sounds as good as any 16″ I’ve tried and can be personalised to preference with tuning, damping and experimenting with the rez head. The included Hi-hats are passable closed but sound just like you would expect from included hats with an entry level kit when open. The same goes for the crash, while the small size makes it passable falling somewhere between a crash and a splash. 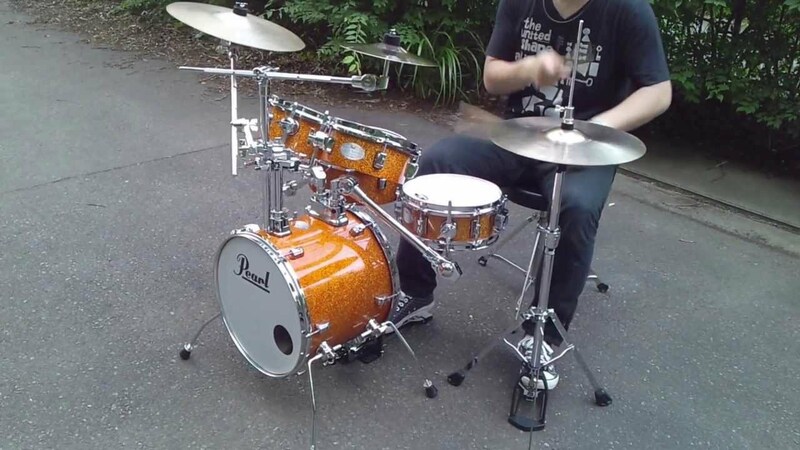 If I was the owner of this kit, the first thing I would do is seal and clear-coat the interior of the snare drum shell. I have yet to come across an entry level snare that didn’t benefit from this. Whether to do the same with the bass drum is a matter of personal preference. Sealing it is never negative, but clear-coating, while improving projection, “thud” and attack, can also reduce some of the warmness and introduce unwanted overtones. The bass drum could however benefit from a slightly thicker rez head. (IMO) The posts that insert in the bass drum would cause less interference filled with foam and capped. First off, I would say that from a value-for-money perspective, The POD is an excellent choice. 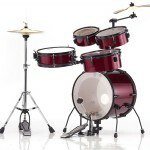 There are drum kits with fuller, bigger sound available, but none with such a minuscule footprint. The component and build quality far exceed my expectations in this price range. The overall design is more or less brilliant and the slightly odd-ball visual appearance gives it a character all it’s own. From certain angles it looks like a giant robotic spider. The only cons I can think of are; 1-The bass pedal simply doesn’t work for me, and 2-For maximum portability, set-up time ends up suffering a little. 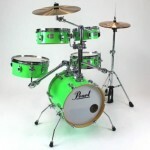 Since I have owned a RT GIG for some time, it’s obvious that these kits are on my recommended list. I hope you found this Rhythm Traveler POD Review interesting and helpful. “The Rhythm Traveler Pod Kit gives you the sound of the original Rhythm Traveler but takes portability to a new level. Shell sizes include a 16×13 bass drum, 8×3.5 tom, 10×4 tom, 12×5 tom, and 12×5 snare drum which are all mounted from the bass drum. 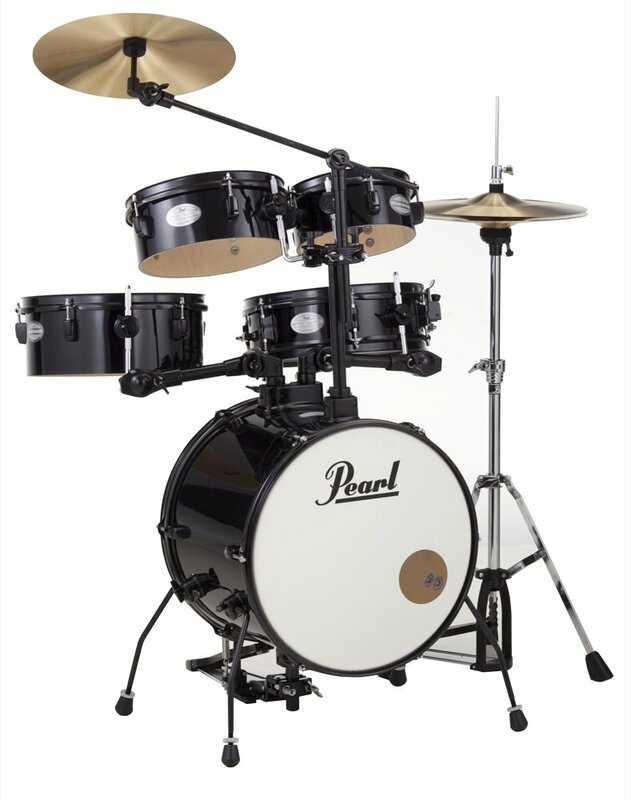 The Rhythm Traveler Pod Kit comes in three finishes: Jet Black, Pure White, and Red Wine and all feature black drum hardware. 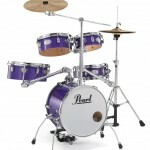 Also included are a set of 13″ Hi-Hat cymbals, 13″ Crash, bass drum pedal, hi-hat stand, and mounting hardware. When the RT POD was first introduced it was called the Rhythm Traveler GIG. It is still called GIG in many parts of the world. The first generation had all chrome hardware and “half round” lugs. The second generation also had all chrome hardware but now featured smaller lugs and a larger 12″ snare. Available in North America in white, wine red and black only.